Exactly how high is Mount Everest? Nepal says it will announce next year. The precise height of Mount Everest has been contested ever since a group of British officers during their rule in India first surveyed the peak in 1849. But in January 2020, Nepal plans to end the nearly two-century-long controversy and declare, once and for all, the height—both snow and rock height—of the world’s tallest mountain. This May, the mountain will see hordes of aspirants who spend thousands of dollars to climb the peak for fame and glory. Joining them will be a two-member Nepali survey team, that will, after reaching the summit, switch on a Global Navigation Satellite System receiver, a device weighing around a kilogram, to store data from the satellite to pinpoint its geographic location. The surveyors will use the Trimble R10 device manufactured by California-based developer of Global Navigation Satellite System receivers, that has been gifted by New Zealand. Chief Survey Officer Khim Lal Gautam and Survey Officer Rabin Karki will be assisted by a number of Sherpa climbers up to the Everest. The other two survey officers—Suraj Singh Bhandari and Yuba Raj Dhital—will remain at base camp to assist the surveyors and monitor activities, at an altitude of 5,364 metres. The government team is expected to move to the Everest base camp this week. Dangol said that a team of highly-experienced Sherpa climbers, led by Ang Babu Sherpa of Peak Promotion, would also be trained before they embark on the mission with the surveyors. “The observation is not difficult. But climbing Everest will be challenging for the surveyors,” said Dangol. To measure the height of the mountain, the department will be conducting four sets of surveys: precise levelling, trigonometric levelling, gravity survey and GNSS survey, covering 285 points with 12 different observation stations. Of the 12 observation stations, nine are located in hills of Sankhuwasava, Bhojpur and Solukhumbu districts. According to the department, the precise levelling is conducted to find height from the southern plains of Nepal to the selected control points. Trigonometric levelling is performed from selected control points (points to which height is carried by precise levelling); gravity survey will be conducted to define the local geoid around the Everest; and GNSS based survey is conducted for determining locations of gravity points, benchmarks as well as the top of Everest. Seventeen surveyors have been mobilised for levelling survey and 13 for GNSS. Since 2017, a huge survey team of 81 people has been working on the project. The total cost for the three-year project could hover to around $2.5 million, the department said. According to Dangol, the levelling survey has been completed so far up to Patale in Solukhumbu district, covering 170 kilometres. And the GNSS survey has been completed on 230 points. Officials said they have yet to begin the gravity survey. Dangol said the project, however, will not be using trigonometric triangulation method to measure the height of the mountain. 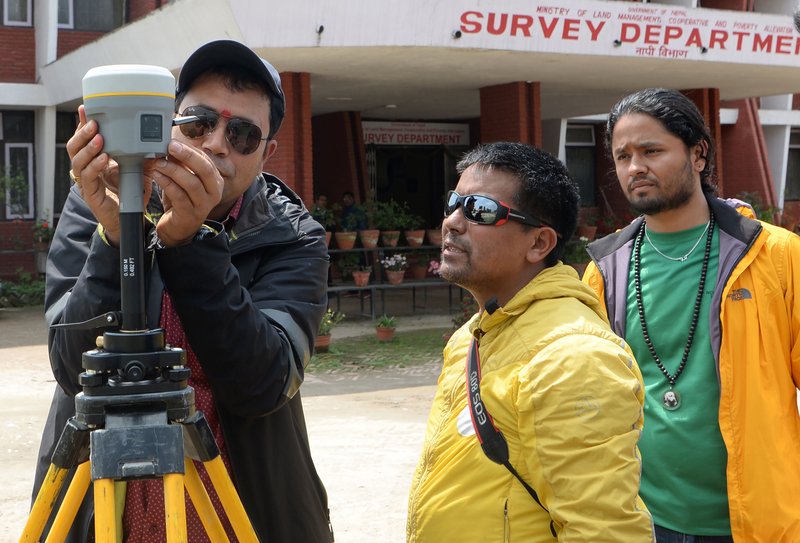 To measure the rock height, the department will use ground penetrating radar, said Niraj Manandhar, former deputy director general at the Geodetic Survey Division of the Survey Department. Ground penetrating radar uses a high-frequency radio signal. The signals penetrate snow but return after hitting the rock, which is then received and stored digitally. “Surveyors then calculate the two-way travel time of the radio signal to ascertain the actual depth,” said Manandhar who worked as a member of Sagarmatha Height Measurement Project. Everest is locally referred to as Sagarmatha by Nepalis. 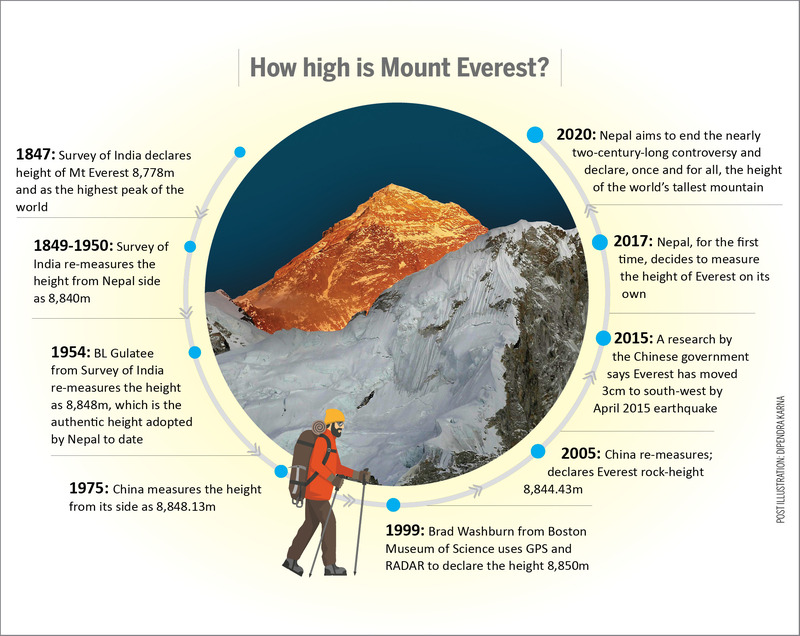 The department said it would also be using the data collected by China and other countries in the past to calculate the height of Everest. “The old data will be used for reference. Normally the old data is compared with new numbers to see if there are any changes,” said Manandhar. "The department has also signed a memorandum of understanding with the National Geographic Society to get the meteorological data because the measurement process requires accurate data of wind, temperature and pressure,” said Dangol. A team of National Geographic Society is also climbing the Everest this season. Nepal, which is home to eight of the 14 highest mountains in the world over 8,000m, has never measured the peak on its own and has been officially using the peak’s snow height of 8,848 metres (29,029 feet) above sea level which was measured by the Survey of India in 1954. Several international institutions and India had expressed their interest to measure the height of Everest. Following the devastating earthquake in April 2015, the height of Everest has become the subject of interest not only for Everest expeditions, scientists and researchers but also for the whole world. Some geologists speculated that the height of Everest could have changed due to the 2015 earthquake, with a possible shift in its position. In 2005, the Chinese State Bureau of Surveying and Mapping re-measured the peak and declared 8,844.43 meters as the Everest rock-height. Chinese and Nepali officials disagreed over the height of the iconic peak. In 2011, the government of Nepal wanted to clear the air by re-measuring the height but it failed due to various factors including political instability and lack of fund. The government has since declared the plan to measure the mountain’s height a ‘national pride’ project. The government collects more than $3.5 million in royalty fees from Everest aspirants every season that normally starts from April and concludes in May. Each climber has to pay $11,000 for a permit to climb Everest. More than 5,000 climbers have scaled the mountain since it was first climbed by Tenzing Norgay Sherpa and Edmund Hillary in 1953.